It’s important that each pair is kept as a pair. TX+ & TX- must be in the pair, and RX+ & RX- must together in another pair. (Just as the table above shows). The + side of each pair is called the “tip” and the - side is called the “ring”, a reference to old telephone connectors. 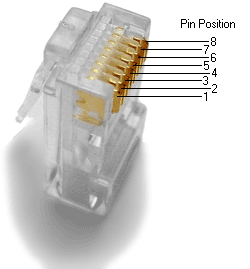 T568A and T568B are the two color codes used for wiring eight-position RJ45 modular plugs. Both are allowed under the ANSI/TIA/EIA wiring standards. The only difference between the two color codes is that the orange and green pairs are interchanged. T568A wiring pattern is recognized as the preferred wiring pattern for this standard because it provides backward compatibility to both one pair and two pair USOC wiring schemes. The T568B standard matches the older ATA&T 258A color code and is/was(?) the most widely used wiring scheme. It is also permitted by the ANSI/TIA/EIA standard, but it provides only a single pair backward compatibility to the USOC wiring scheme. The U.S. Government requires the use of the preferred T568A standard for wiring done under federal contracts. In a departure from both 10BASE-T and 100BASE-TX, 1000BASE-T and faster use all four cable pairs for simultaneous transmission in both directions through the use of adaptive equalization and a five-level pulse amplitude modulation (PAM-5) technique. For this reason, there are no dedicated transmit and receive pairs, and consequently, crossover cables are never required for 1000BASE-T, 2.5GBASE-T, 5GBASE-T, 10GBASE-T, and 40GBASE-T communication. From 1000BASE-T onwards the physical medium attachment sublayer (PMA) provides identification of each pair and usually continues to work even over cable where the pairs are unusually swapped or crossed.